I read many books in 2017; I drank many cups of coffee. There’s an argument for my reviewing the various coffee drinks I’ve had over the year, intertwined with the locations in which I enjoyed them (ah, the latte I had at that ice cream parlour in Helsinki back in May…), but on balance I think I’m better off saying something about what was read. So here’s the next of my reviews of the year, being the year in books. 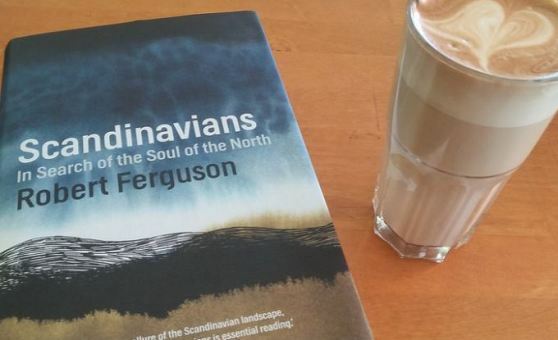 But let’s start with the book I read in Helsinki, which is illustrated above alongside the famous latte, Robert Ferguson’s Scandinavians. Finland is, of course, not part of Scandinavia (you knew that, didn’t you? ), but its proximity helped with the perspective. 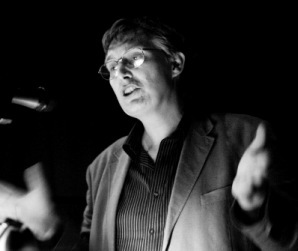 Ferguson is a British translator and biographer (Ibsen), long resident in Norway. 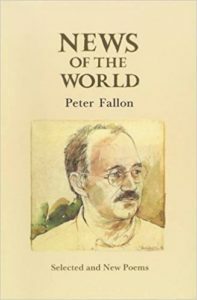 His book is an engaging, discursive exploration of the Scandinavian countries, through a combination of memoir and historical anecdote. It rambles all over the place in its attempt to explain to what degree the countries’ reputation for melancholia is grounded in reality. If it came to a conclusion, I no longer remember it, but what matter is the journey, expressed through easy, well-crafted prose. For some reason I read several books on war this year. Like many others (to judge from her books’ appearance in many Waterstones’ front windows) I discovered Svetlana Alexievich, the Belarusian journalist, whose extraordinary use of oral history interviews to document what has been unsaid (mostly by women) about the crises of the USSR/Russian modern era earned her the Nobel Prize for Literature in 2015. Boys in Zinc is devastating to read. 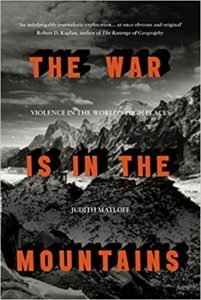 She interviewed mothers and their combatant sons (but seemingly never the fathers) about the disastrous intervention by the Soviet Union into Afghanistan in 1979. The interviewees struggle to resolve the differences between propaganda and the reality of bodies coming home (in zinc coffins), having been killed for no clear reason. 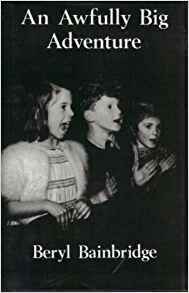 The book ends with an unsettling account of how Alexievich became a figure of hate for several of those she interviewed, who felt she had misrepresented them (they sit behind her in a courtroom, muttering words of violence against her that the court misses but she hears all too clearly), because she has exposed the emptiness of their faith. Her purpose in writing is to give people their true voice, but they are not always ready to hear it. 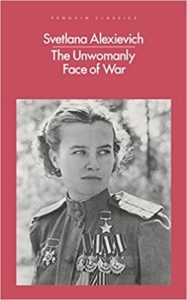 Her first book, on women’s memories of the Second World War, The Unwomanly Face of War, is what made her famous, but I found it troubling, pandering to myths as much as it hoped to look beyond them. The interviewees in Boys in Zinc had had less time to compose their memories, which is why their own thoughts so shocked them when exposed in print. 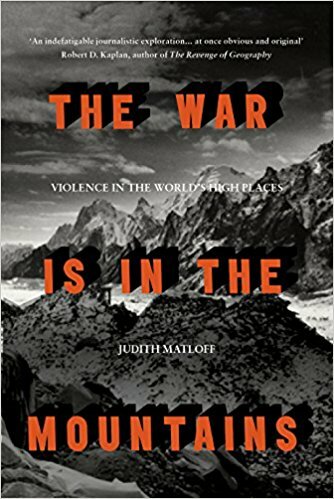 I very much enjoyed Judith Matloff’s The War is in the Mountains, a novel study which looks at conflicts across the world which take place among mountain communities – in Albania, Mexico, the Himalayas, Kashmir, Dagestan etc. It has a thought-provoking thesis on how high and inaccessible locations breed isolation and violence, which in part is too obvious (people who lives in awkward high places are difficult to shift, so awkward and difficult people will tend to gravitate upwards) and in part offers a key, maybe, to explaining something of a troubled world. At any rate, it’s a fine read, and first-rate journalism. Also trying to understand present wars is Theo Farrell’s Unwinnable: Britain’s War in Afghanistan, 2001–2014, the title of which says it all. 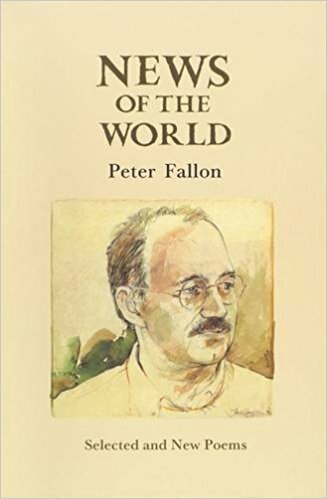 The book is compelling, and probably comprehensive, though it rather loses interest in the British halfway through and devotes greater attention to the more successful Americans. 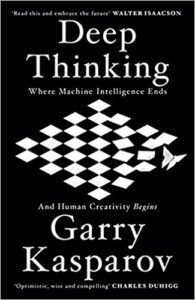 It is also noteworthy for the way it documents the thinking behind modern warfare, full as it is of management-speak, as though the way to win a war is, ultimately, the same as it would be if you were undertaking a major building project or constructing a complex business takeover. The tragedy of the Afghan war (of all Afghan wars) has been that the other side had not read the same manuals. 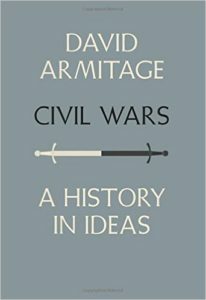 My book of the year, by a narrow margin, is David Armitage, Civil Wars: A History in Ideas. 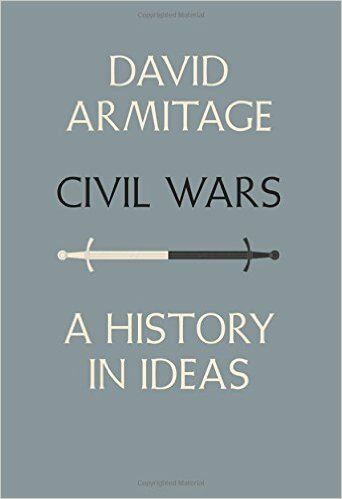 Its subject is the history of civil wars, or what we mean by civil wars, because the idea of civil war is something that is ever-changing, as notions of what a society or a nation is change over time. Was the fighting in Syria as civil war? President Assad saw it as a rebellion. Those fighting him viewed themselves as taking part in a resistance. Outsiders, with their own views of the state, saw it as a civil war, but to use (or not use the term) has all sorts of implications, relating to legal boundaries, political understanding and ethics. Civil Wars is not only an illuminating and timely read, but it is also a beautiful book in itself. It is a model of typesetting, binding and plain design, to which all plaudits to Yale University Press for their very good taste. I resolved to read more novels this year, and didn’t do too badly – though I was more interested in catching up on past works missed rather than reading the latest offerings. A novel needs to be bedded down a little in time before it gets my attention. I always enjoy reading Beryl Bainbridge, though always with the same reservations. The sharpness of style is diminished by the limitations of the black conclusions, though those are what make her works so distinctive. An Awfully Big Adventure is the quintessential Bainbridge story, with its dark final twist too cruel to be credible; Watson’s Apology had an engrossing history behind it, but maybe there was a bit too much of the history. I had set out this year to re-discover Balzac, many years after I first discovered his interconnected novels and was thrilled by the adventure. Now, alas, the artifice grates, the simplistic view of women is annoying, and the excess of expertise on display (particularly when he wishes to explain financial or legal matters) wearisome. But there are passages of genius – the phantasmagorical description of the antique shop in The Wild Asses’ Skin as holding the residue of the world is of the very highest order. And the more you get into Balzac’s world, the more it becomes your world. So I shall press on. Among other novels, I finally got round to reading Chinua Achebe’s Things Fall Apart, which is the perfect work of art, and Arrow of God, which complements it. Other novelists were tried out – Elmore Leonard, Javier Marías – but I shan’t be returning. I will return to Thomas Love Peacock. Peacock was a complete original. He wrote novellas composed almost entirely of witty dialogue between representative types who find themselves holed up in some picturesque location. Plot is minimal, argument dominant, classical allusions are everywhere, the tone parodic, the style exquisite. But you can only take so much of such preciousness. I found Headlong Hall a witty and ingenious confection, but the similar Crotchet Castle was too much to take so soon. One Peacock a year is sufficient. 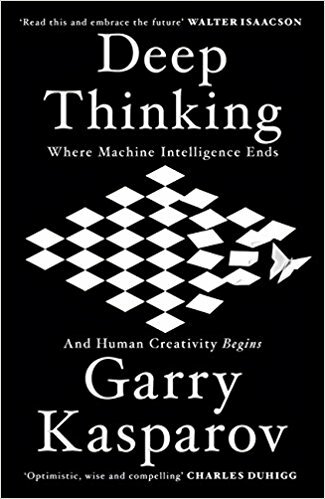 Among other books of note, I very much enjoyed Gary Kasparov’s Deep Thinking, which is a readable and stimulating study on how humans will live in a world of thinking machines. What gives the book its particular flavour is the former world chess champion’s account of how he lost to the computer programme Deep Blue. Despite all he claims about having got over the shock, he has not escaped from it at all, talking of conspiracies and making barbed accusations where he purports to be making compliments. This section of the book wholly counters the rest, which is written in an optimistic and generous spirit. Another memorable but flawed read was Richard Lloyd Parry, Ghosts of the Tsunami, a study of Japanese society in the light of the trauma of the 2011 tsunami. It is a strange book, which aims for the the poignant and revelatory, but which for me spent too much time over the misjudgments made in the failure to evacuate one school in particular. It seemed to be trying to find lessons in something for which no lessons could really be drawn, looking for tragedy but finding only aftermath. Thoughtful and enjoyable reads included Derek Thompson’s Hit Makers, a wide-ranging history of ‘how things become popular’, skipping easily from pop songs, to Internet memes to blockbuster films, and riddled with surprise facts and figures designed for sharing; Clive James’s Play All, a study of the phenomenon of box sets, which ably mixes erudition with fan worship, but is weakened as far as I’m concerned by James’s lake of enthusiasm from Breaking Bad (of which only good things should ever be said); Abbey Smith Rumsey’s When We Are No More, a fine account of how libraries are (or need to be) facing up to the challenges of preserving our fragile digital world; and Laura Spinney’s exceptional Pale Rider. 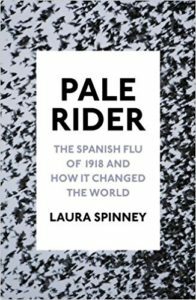 This is a history of the ‘Spanish’ flu (it didn’t come from Spain), written by a science journalist who has also written novels, and it shows. Not in any narrative tricks – human interest stories are never over-exploited – but in clear argument and well-marshalled understanding across peoples, lands, subjects and beliefs. 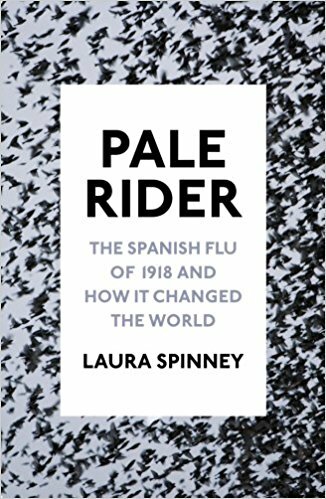 The book aims to show how the flu epidemic that killed many more people than had died in the First World War that preceded it had a profound effect on the world today. 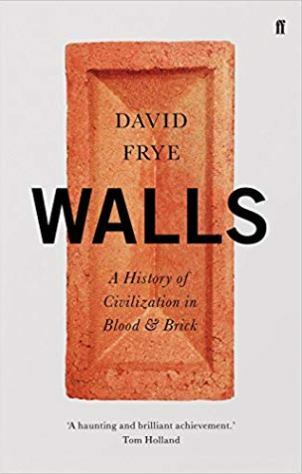 The chapter alone on how the virus affected the arts opens up new areas of study, as you see how health and circumstance determine culture and society. An exciting, eye-opening book. 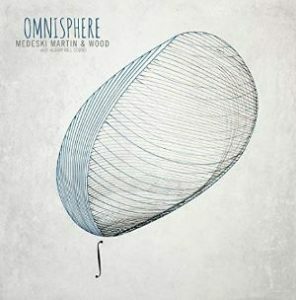 like a pearl, upon a blemish.